Discover purpose-engineered versatility and performance in the 47' Sea Ray 470 Sundancer GOOD TIMES, from the hardtop with two retractable sunroofs, to the wet bar with icemaker and available entertainment amenities, to the sun pad with adjustable "sun gate" backrest. Interior elegance comes in the form of two staterooms and two heads with new interior fabrics and finishes. SEA RAY - BRUNSWICK, FACTORY EXTENDED WARRANTY THROUGH SEPT-2018 COVERS BOW TO STERN VIRTUALLY ALL COMPONENTS, APPLIANCES, PROPULSION AND ELECTRONICS ON BOARD. West Florida Yachts would love to guide you through a personal showing of this 47' Sea Ray 470 Sundancer 2012. 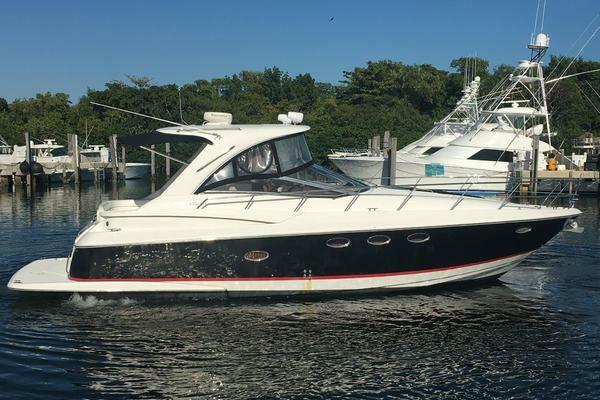 This yacht for sale is located in Fort Lauderdale, Florida and priced at $469,000. For a showing please contact us by filling out the form on this page and we will get back to you shortly! The perfect Express Cruiser, she is and has always been meticulously maintained by owner. All yearly services performed like clockwork by our local competent MarineMax maintenance crew and mechanics. Her Cummins MerCruiser upgraded engines QSB 480s, upgraded Cummins Onan 13.5 kW generator and her Zeus Pod Drives are serviced yearly by the factory authorized Cummins mechanics. All maintenance records and invoices will be made available to interested prospects. In Mid March 2018 owners spent nearly $6,000 in maintenance work done on Good Times. Comprehensive yearly maintenance performed by Cummins MerCruiser certified mechanic, all fluids, Racors and filters replaced. Every bulb and light fixture have been replaced with all-new Marine LED lighting, including running and anchor lights. SeaMaster Marine LED lighting was installed throughout the engine room and rear cockpit seat. All Zone-Controlled Reverse-Cycle Cruisair (total of 3) units with electronic controls, fully customizable with the power-saving "Dehumidify Mode". Helm and Cockpit as well as Salon have 16,000 BTU unit with an 8,000 BTU unit for the forward stateroom and head. Complete detailed servicing with descaling, tune-up, pressure checks etc. performed only a few weeks ago. The A/C units work impeccably. The salon and VIP stateroom have the gorgeous upgraded Allspice wide plank hand-finished wood flooring which is like new. Cabinetry throughout is Walnut joinery with matte finish – all immaculately maintained. The galley Clam-Shell color countertops are scratch free in superb condition. A brand new dual-volt Isotherm Cruise stainless steel Refrigerator/Freezer was installed only weeks ago. All appliances, including the convection microwave, Electrolux central vacuum, and cooktop range are like new. The salon and main swing-down TV was just upgraded to a Samsung 28" Smart LED unit with Wi-Fi. The KVH DSS satellite dish is connected to 2 working DirecTV receivers that connect to all 4 on-board TVs, 2 per receiver. Custom-made matching blue Ottoman's in salon offer more comfort while adding stowage. Custom linens in sealed packs will be supplied along with her navy blue embroidered towels sets. Gorgeous cedar closets with 2 in the forward stateroom and 1 in the aft stateroom. The helm's solid teak floor and the cockpit's SeaDek 6-mm "Teak" Flooring are immaculate. There are no mold or mildew stains anywhere and the helm and cockpit seating, upholstery and cushions look and feel as if new, stain-free, no cracks, holes or damage anywhere. Custom-made matching blue Ottoman's in salon offer more comfort while adding stowage. All electronics on board are 100% calibrated and perfectly functional. Original Raymarine Multi-Function Displays have been upgraded to HybridTouch touchscreen e125 and e127 (with built-in sonar). MFDs were recently upgraded to Raymarine's new Lighthouse 2, V-17 OS, now with Dock-to-Dock auto-routing. These new MFDs - with their built-in Wi-Fi - now allow you to remotely connect with App and to, also, perform firmware and software upgrades directly from the MFDs with complete backups of all your waypoints and tracks. Navionics Platinum USA chart has most recent version. Outdoor Raymarine CAM100 Day/Night camera installed on DSS mount with 140-degree rear view, including the swim platform, viewable on MFDs and/or on Raymarine App remotely. MerCruiser Smartcraft Vesselview updated to latest firmware. Installed MerCruiser NMEA 2000 BackBone Gateway to interconnect all onboard electronics to the MFDs and to new accessories. USB charging ports installed on helm. Marinco Receptacle (Trolling) with 40A Marine Circuit breaker installed on cockpit for high-power air pumps & accessories. Her engine room is spotless. You can literally eat off the floor. No oil, no stains, no leaks. Her Cummins mains are washed and waxed twice a year. All bilge areas are cleaned, sanitized and thoroughly dried. Spare 5-gallon engine oil jugs are securely fastened in custom-installed container. EXTERIOR: her topside & hull waxing is completed 4 times a year. Her gelcoat is impeccable with full gloss, stain-free and scratch-free. There are no dents, dings or damage and the entire rubrail has never been scuffed. Our custom Weblon windshield canvas keeps the UV damage away throughout the helm and interior. The brand new Sea Ray embroidered adjustable foredeck sunpad chairs with black matching Sunbrella canvas as well as the new cockpit electric grill will be delivered to her buyer. Sunbrella black canvas recently replaced with new isinglass rear panels. Port and starboard canvas end panels are new and outfitted with EZ2CY hard glass. German-made V-Kool UV reflective film was installed on both sunroof panels with a 2nd tint underlying tint layer greatly reducing excessive heat in the helm and cockpit. Enjoy ice-cold beverages with your cockpit Isotherm drawer refrigerator. SWIM PLATFORM, DINGHY/ TENDER SYSTEM: Our Sea Ray 470 has a fixed swim platform with heavy-duty swim ladder. Installed is the YRM custom-fabricated dinghy loading/unloading system with 12V Warn Power Winch, easy access outdoor 40-Amp plug and all 316 stainless hardware turnbuckles, cables and tie-downs; can handle tender /- 450 lb with 1-button loading & unloading. Includes wireless AND wired winch remote control for push-button seamless operation. Pictures depict the complete system. Installed aft of the swim platform are 2 folding 316 stainless cleats to greatly ease the tie-up of your tender or jet skis while mooring or at anchor. DINGHY SHOWN ON SOME PICTURES IS NOT INCLUDED. Total of 4 TVs on board, 3 have dedicated DVD players in staterooms & salon. The new salon Smart LED TV is connected to the Sony Marine entertainment for surround sound. Her anchor chute was replaced with an all-new heavy-duty hex bolt plate-reinforced for long-term, heavy-weather anchoring. Her windlass and remote controlled- spotlight are always covered with their Sunbrella canvas.